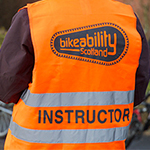 Do you know a Bikeability Scotland instructor who's gone the extra mile? Nominate them for a Bikeability Scotland Award! This award is for the volunteers who help deliver Bikeability Scotland at their local school. It might be a parent, grandparent, friend of the school or even a local cyclist. Nominations can be made by [teachers, parents / anyone?]. This award is for Bikeability Scotland instructors and is nominated by pupils. Your instructor might be your class teacher, a parent, someone else from your school or someone who comes in to teach Bikeability. You just need to let us know why your instructor is the best in Scotland! Closing date for applications is 28th September. Prize winners will be announced and presented at the Evening Civic Reception as part of Cycling Scotland's Annual Conference in Dundee on Monday 5th November 2018. "Andy does not take any carrying on, she makes sure that we are ok, safe and that we understand, she gives us help if we need it." "She is fun and helps us with Bikeability, she is not too strict but still tells us what to do."